The FMCETHX001 Ethernet Expansion Module is an easy to use module featuring RTL8211E-VB-CG which is a highly integrated Ethernet transceiver that complies with 10Base-T, 100Base-TX, and 1000Base-T IEEE 802.3 standards. This FMCETHX001 Ethernet Expansion Module has 4 Gigabit Ports- each individually capable of providing robust transmission and reception capabilities at 10Mbps, 100Mbps, or 1000Mbps and also all the 4 ports are capable of working simultaneously. The FMC module is ANSI/VITA 57.1 standards compliant. 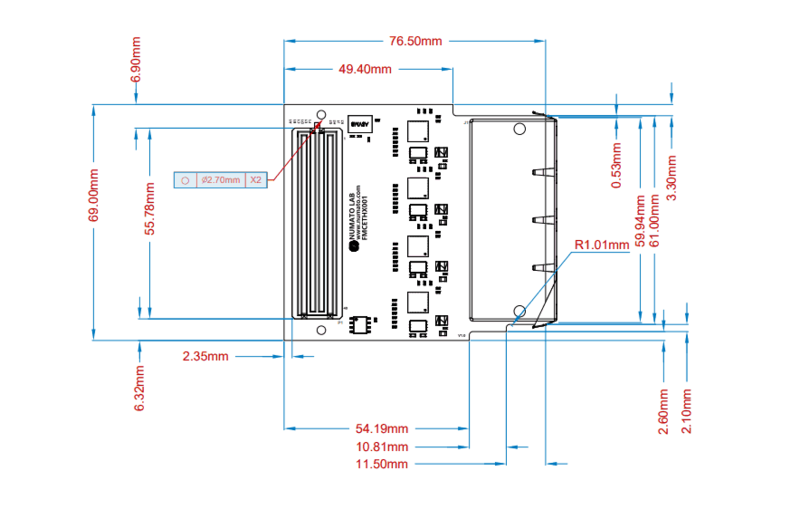 This expansion module supports 3.3V signalling for RGMII. The Reduced Gigabit Media-Independent Interface (RGMII) is used to interface Ethernet MAC on FPGA with Gigabit Ethernet PHY chips (RTL8211E) on 4 Port Gigabit Ethernet FMC Module. RGMII provides a media-independent interface so that there is compatibility between MAC and PHY irrespective of the hardware used. 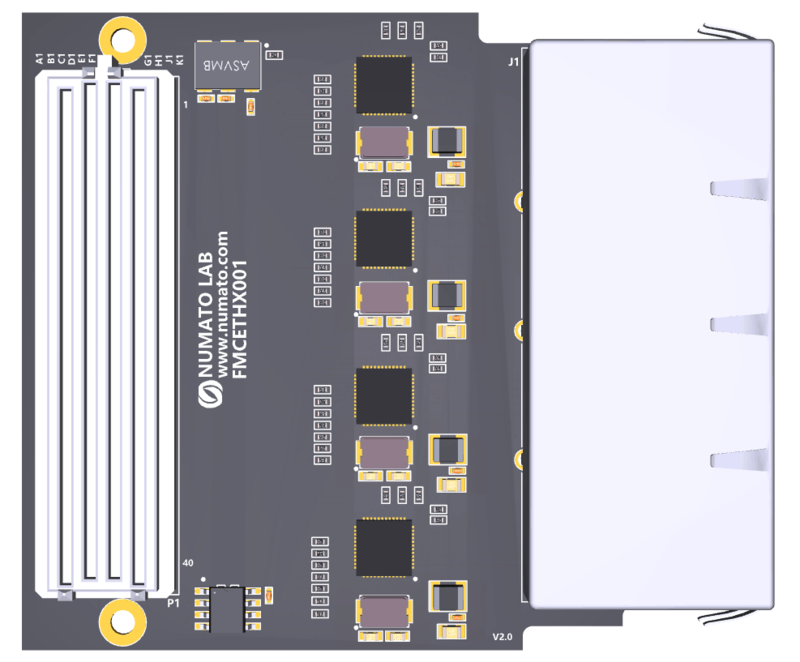 This expansion module is compatible with Numato Lab’s FPGA boards such as Nereid Kintex 7 FPGA Board, Proteus Kintex 7 FPGA Board and Tagus Artix 7 FPGA Board. 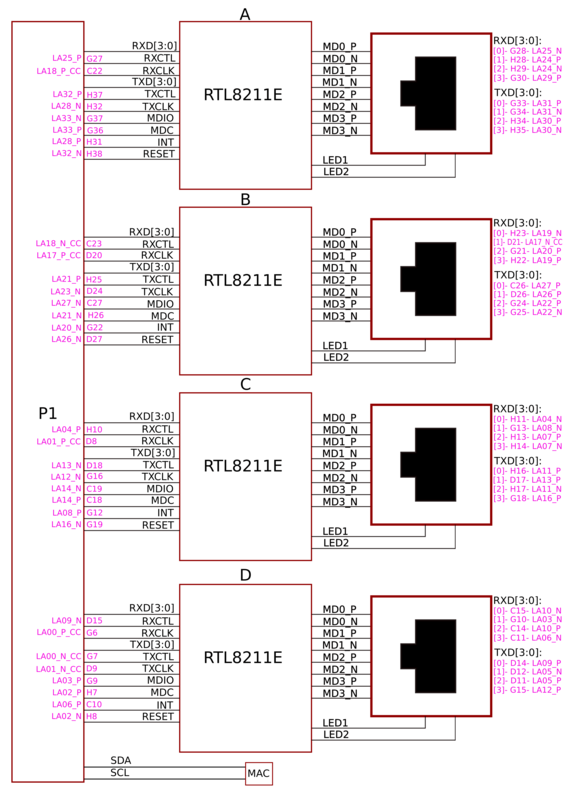 Along with the module, you may use either of the below boards, or any other FMC compatible FPGA board. This diagram should be used as a reference only. For detailed information, see the schematics at the end of this document. Details of individual connectors are as below.